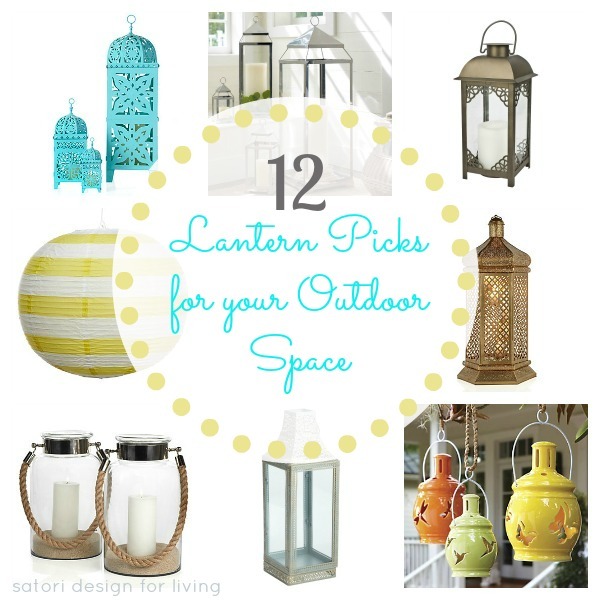 Staying within last week’s outdoor theme, I’m sharing a few lantern options I came across while we were enjoying a Sunday afternoon out and about, in addition to a handful I’ve stumbled upon online. As mentioned, we have the foundational pieces in place for entertaining in our back yard, but we definitely need to add some new garden decor to ramp up the beauty and function. Although we installed lighting to our deck a couple years ago for safety reasons, as well as ambiance, I still find our yard feels too dark at night. Outdoor lanterns are probably the easiest and most cost effective solution. Classic outdoor lanterns that are able to hold large pillar candles are probably my favorite. A good option is replacing a burning candle with a battery operated one that won’t drip or possibly overheat and shatter the glass. If you’re looking for outdoor lanterns that are on trend right now, consider something with a cut out or lace pattern. Solar lighting has drastically improved in aesthetics and quality over the past few years, and is definitely a low maintenance and safe option for lighting your outdoor space. And, finally, if you want to add whimsy or need a pop of color in your outdoor space, consider these fun lanterns. Later this week I’ll be showing you different ways to use lanterns in your outdoor space. For our yard, you’ll have to wait until May’s Outdoor Extravaganza series to see what style of lantern I choose and where I end up using it. What is your favorite style of outdoor lantern? Seen any fantastic options in your travels? I think I love ALL of them! There is nothing nicer than sitting outdoors by candlelight on a summer night. Come on summer….so that we can actually use the deck! I do love the teal ones from Z gallery though…something fun. Although I am certainly drawn to the bright fun colours as spring *finally* hits in Ottawa, I can’t resist the more traditional with a travel — the Marrakesh latern is my fave! I love outdoor lanterns, both in the character and charm they bring to an outdoor space, but also in the function of adding additional lighting when the sun goes down. I don’t think you can go wrong integrating a few of these options to your outdoor decor! I love the once with lace patterns, but need to dial up the colour in our yard. Looking forward to getting outdoors in May! Wow, these are some lovely options…I am crushing on the Portland lantern myself! We are gearing up for some outdoor projects…thank you for inspiring me today! I can’t wait to see your May Outdoor Extravaganza series!!! I must admit that I buy lanterns on a whim and don’t really have a style… hmmmm, I wonder if I could tie them all together somehow… thanks for flicking the switch to on! I love them all!! I have been wanting to put lanterns in my backyard.